Before this set I was unfamiliar with almost all of A7X's music, but judging from the flood of fans pouring into The Rave I was in for a good show. The last time I was at a sold out show was back on The Unholy Alliance tour with Slayer and Lamb of God. The venue was packed to capacity and ready to burst at the seams. I took my spot at the side of the stage and as I waited for the curtain to drop and the show to start, a thunderous chant of A7X accompanied with feet stomping the hardwood floor filled the ballroom. The show started and I took my shots for the first 3 songs and got to sit back and watch the show. A7X had a tight set, I really dug the dual guitar solos and excellent harmonies created between Synyster Gates and Zacky Vengence. The bass and drums were kickin and spot on. Singer M.Shadows sounded great when you could hear him over the crowd, I can't remember the last show I was at where the crowd new every song and sang along word for word almost drowning out the band at certain points. The set lasted over an hour with songs including "Bat Country", "Beast And The Harlot", "Almost Easy", "Scream", and "Afterlife". The band put on a great show and seemed to feed off the energy of the crowd. I have to admit I wasn't a fan before tonight, but I am now. 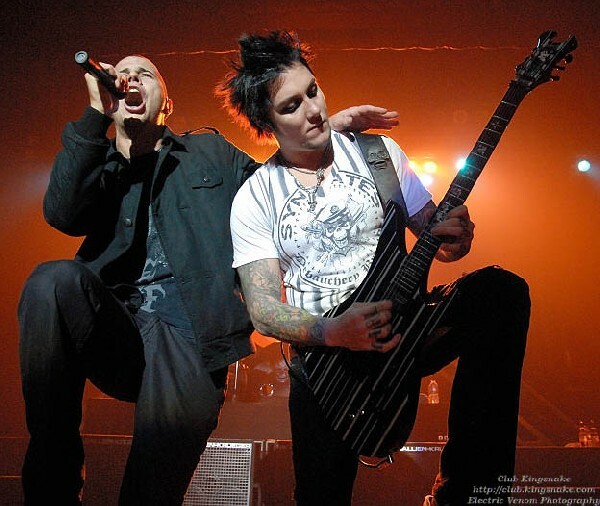 Catch Avenged Sevenfold where you can you wont be disappointed.